Calgary-North West MLA Sandra Jansen, who crossed to the NDP from the Progressive Conservative Party almost a year ago, is Alberta's new minster of infrastructure. The infrastructure portfolio was previously held by Brian Mason, who was also transportation minister. Mason will remain transportation minister and continue in his role as government house leader. Premier Rachel Notley said splitting responsibility for the ministries was required because they both were large in scope. She suggested appointing a Calgary MLA to head the infrastructure portfolio was practical, not political, as Calgarians are still hurting economically and more work needs to be done. "A responsive government, regardless of where political support is or isn't, that's not what this is about," Notley said. "This is about being a responsible government to the people of the province who elected us." Jansen said her personal priorities are building the new Calgary cancer centre and the Green Line LRT. She added construction across the province is a group effort among all members of cabinet. "The infrastructure build is phenomenal," she said. "The money being put into this province right now is life-changing for people." Jansen wasn't the only MLA to receive a promotion. 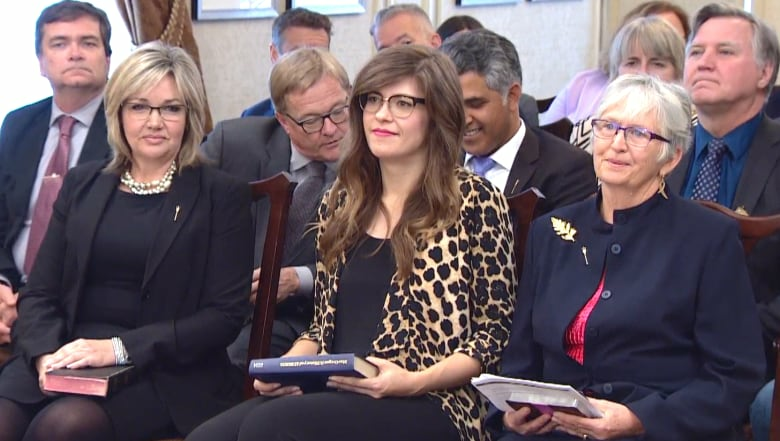 Fort Saskatchewan-Vegreville MLA Jessica Littlewood and Sherwood Park MLA Annie McKitrick were appointed parliamentary secretaries respectively for economic development and trade, and education. Calgary-Currie MLA Brian Malkinson will sit on treasury board to increase Calgary's representation on the cabinet committee. Strathcona-Sherwood Park MLA Estefania Cortes-Vargas was made a member of the legislative review committee of cabinet. Cortes-Vargas is also the NDP caucus whip. Jansen, a former journalist, was first elected as an MLA in 2012, and served as an associate cabinet minister under former PC premier Alison Redford. She briefly ran for the PC leadership last fall but left on Nov. 8, 2016, citing harassment and intimidation from the volunteers of another campaign. She crossed to the NDP nine days later. Jansen laughed when she was asked whether she could have imagined five years ago that she would become a full cabinet minister under an NDP government. "You could have knocked me over with a feather if you had have shown me this scenario a year ago," Jansen said. "You learn and you grow. There is no manual for doing this job." While what happened to her was difficult, Jansen said, it forced her to listen to her internal voice on a number of issues. "The family that I got out of it is worth every moment of the pain," she said. The last time Notley shuffled her cabinet was in January, when she split the human services ministry into two: children's services and community and social services. The move came in the midst of public ire over how the government handled the Serenity case — a four-year-old girl who died while in kinship care.